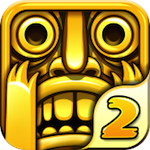 Imangi that: Temple Run 2 (Free) launched hot on the App Store. But how hot? Get this — it hit over six million downloads within the first 24 hours of its existence and has grabbed 20 million downloads since its launch just last week. Chart-wise, it started sitting pretty as the number one “Top Free" app in under eight hours, and it’s currently one of the top three in “Top Grossing." It’s number three at the moment, to be specific. When we asked Imangi’s Keith Shepard to describe what this amount of success feels like he used the word “overwhelming," which seems totally fair. He also noted that the studio is “thrilled" that fans want more Temple Run and the new game will see some new content down the line. We’re guessing people will be more than eager to update.